Whether it's your wedding or your BFF's, these sherwani stores in Commercial Street are going to set you up from the simple to the grand sherwanis so that you look your ethnic best. Plus, most of these stores also take up custom orders as well as have a collection that looks straight out of a Bollywood movie. Move over Virat Kolhi! A men's only store, Outfit caters to all your wedding, sangeet, and festival wear with their extensive collection. Prices start at INR 3,000 for simple sherwanis and most of their collection of wedding-ready sherwanis are glitzy and come with all sorts of embellishments. 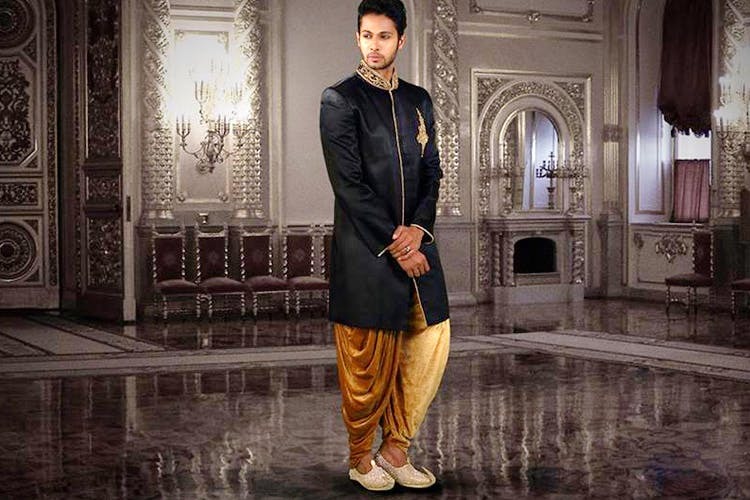 They also do sherwani suits and sherwani-style kurtas that are ideal for receptions and sangeet. Our go-to store for sherwanis and kurtas, Zenith's collection of sherwanis are extensive too. Browse through the catalogue or those on display. If you are still not satisfied, ask them to make you a customised piece. They can stitch very Bollywood-ish designs like the ones you have seen in Yeh Jawaani Hai Deewani and Ae Dil Hai Mushkil. Kurtas start at INR 650 with the bottoms starting at INR 850. Ready-made sherwanis start at INR 3,500. Specialising in all kinds of suits, Western Stores will set you up only with the grandest looking sherwanis. Finding a subtle one is hard because all their red, blue, green, and gold sherwanis come with enough bling to steal everyone's attention from your partner. Negotiation is a big no here and prices start at INR 5,000. Trendy, designer sherwanis are what you get at Meraj. They do customised orders for both the bride and groom and if the two of you are looking to getting matching outfits, we suggest hitting up this store. They designs can be chosen from their catalogue but if you have a design in mind, consider it done. Do check out their collection of ethnic jackets and bandis too. If custom sherwanis are your thing, Commercial Street is filled with tailors and studios who can stitch you one. Rabbani Tailors & Outfitters, for instance, can stitch sherwanis on a budget. All you need to do is bring the design and fabric. You can read more about men's tailors in Commercial Street here.